Last week a friend gave us the first figs of the season and damson plums that she’d picked from her trees up North. We quickly devoured the figs but you can’t do that with damson plums – they’re quite sour and are best cooked. I regularly buy excellent damson plum jam from Terry Lister so thought it best stick to that rather than making some myself. 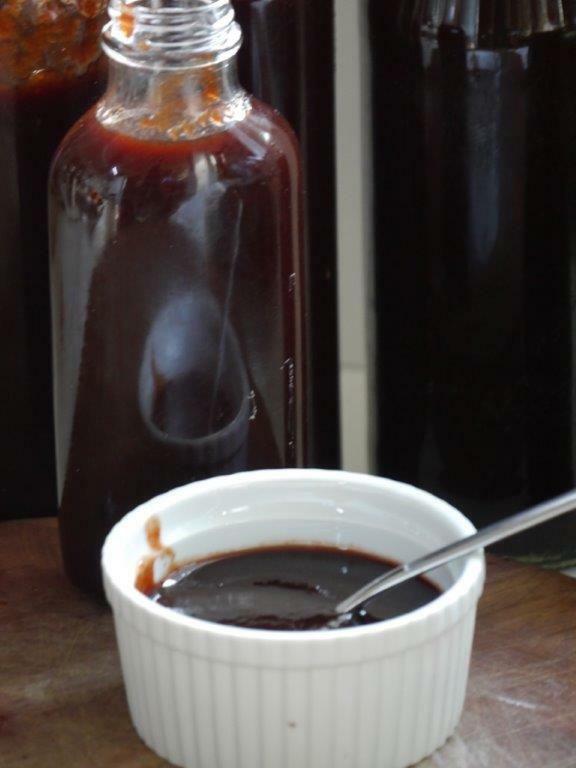 Instead I decided to make a spicy plum sauce that would be particularly good to go with Chinese style crispy roast duck that we were having for dinner. 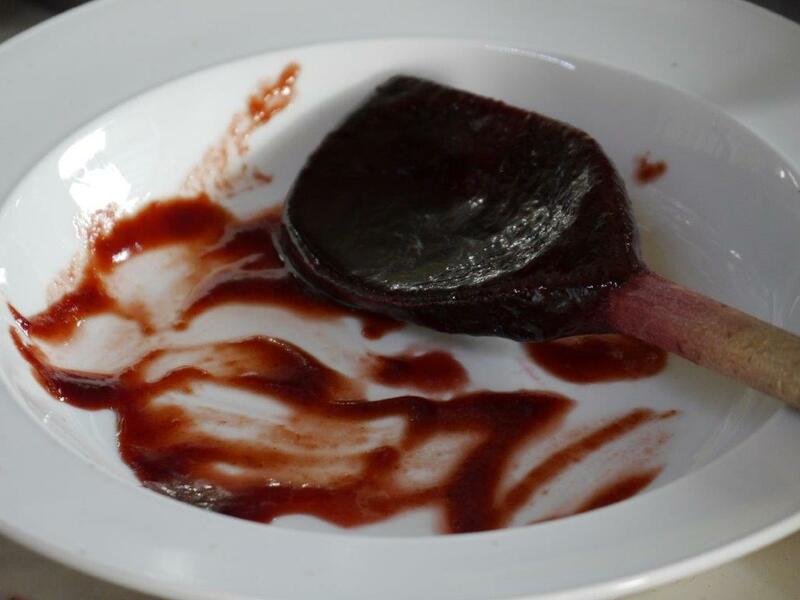 The sauce was great with that and just as good with barbecued sausages, grilled meats and more. 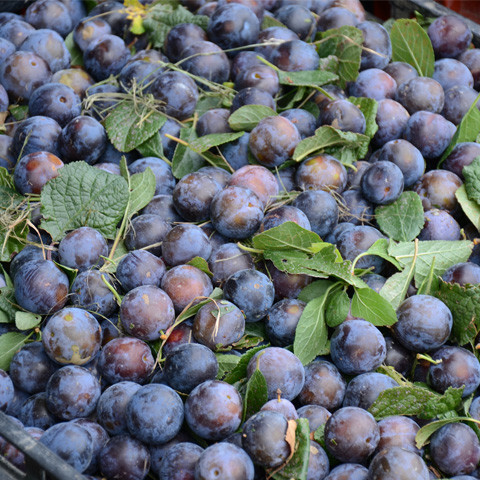 Damson plums are probably a little hard to come by unless you have a tree so use any other sort of plum and perhaps use less sugar as other plums will be sweeter. Into a big pot put the plums, vinegars, garlic, onion, ginger, garlic, chillis, Sichuan peppercorns and allspice. Bring to the boil and simmer for about an hour until the plums are falling apart and everything else is mushy too. Cool a little. Place a sieve over a large bowl and, in batches, push as much of the plum mix as you can through the sieve. Discard the stones and anything else that can’t go through. Pour the smooth sauce back into a large pot and bring to the boil. Add the sugar, soy sauce and fruit jelly. Gently simmer for about an hour. The sauce will reduce and gradually thicken. Taste. If you want it spicier add a teaspoon or more of chilli powder or cayenne pepper or, if you know you want it quite spicy, start with more chillis at the beginning. I started with 2 fresh chillis and ended up adding a teaspoon of cayenne pepper. The resulting sauce is mildly spicy. Sterilise a few sauce bottles and pour in the hot sauce. It’s ready to use immediately.